Do you own a business? Work in a position of sales or marketing? Just like to get out and meet new people? I would like to invite those of you in the local area to a special Visitor’s Day Meeting of the Peninsula Referral Partners BNI Chapter of Business Network International. 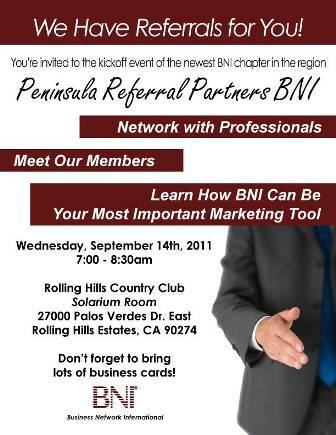 This is a networking group that I am part of which meets weekly in the Palos Verdes area at Rolling Hills Country Club. BNI is a business and professional organization whose primary purpose is to exchange qualified business referrals. People who GIVE business referrals, GET business referrals. At BNI, we invite only one qualified person from each profession to join a chapter and our chapter is currently looking for various professions to pass business referrals to. If you are interested in joining me next week, please send me a message and I would be happy to include you. I look forward to seeing you on September 14th, 2011 at 7:00am! People aren’t strangers if you’ve already met them. The trick is to meet them before you need their help. If everyone in your network is the same as you, it’s not a network, it’s an anthill. In networking, you’re only as good as what you give away. Cream doesn’t rise to the top, it works its way up. 2am is a lousy time to try to make new friends. Your network is the best, most empathic, and most credible reflection of your success and your talents. If you network hard for thirty-five years and build pivotal contacts in strategic areas of business, you can become an overnight success. Most people think they can get by on charm alone. I wouldn’t advise it. Networking is not a numbers game. The idea is not to see how many people you can meet. The idea is to compile a list of people you can count on. The wise person isn’t the one who makes the fewest mistakes. It’s the one who learns the most from them. When God closes a door, somewhere God always opens a window. You can’t always be an expert. You can’t always know an expert. But you can always hire an expert. Your best network will develop from what you do best. Prepare to win — Then prepare to dazzle. Thanks so much for posting and for the invite! This all is valuable information! Thank you for sharing, Jim.